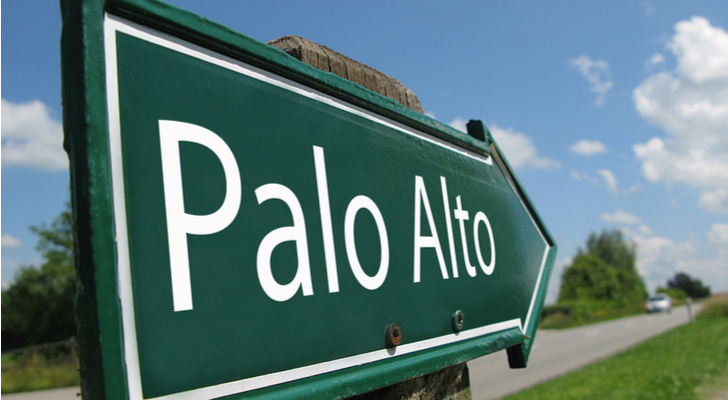 Shares of cloud-based security company Palo Alto Networks Inc. (NASDAQ:PANW) rallied 4.4% on Tuesday and in so doing accomplished an important technical feat that now sets up a bullish trade with a well-defined reward to risk for traders and active investors alike. Best of all, PANW stock now offers a very clear risk level to trade against. Part of my top-down process for analyzing and trading the stock market involves looking either for relative strength or relative weakness (or changes from relative one to the other) from industry groups within any given stock market sector. Simply put, I want to be long or buy those groups of stocks displaying relative strength and selling or avoiding those showing relative weakness. To wit, shares of cloud computing stocks such as PANW stock in recent weeks and months continued to display relative strength versus the broader technology sector, so I have been closely monitoring this group. We don’t, however, want to blindly buy those relative strength stocks at any price. Rather we wait for pull-backs to support followed by bullish reversals. Hint — that’s exactly what PANW stock did on June 12. For some much-needed perspective, let’s note that on the multiyear weekly chart, PANW stock for the past month and a half has consolidated above a key previous area of technical resistance. All else being equal, the black horizontal line around the $198-$200 mark through the lens of technical analysis 101 had to be “re-tested” before the stock can push higher on a more sustainable basis. Last week, following the company’s latest earnings report, the stock dropped right back to this former line of resistance. While this current week is far from over, so far a bounce off this line is attempting to take shape. On the daily chart, we see that last week’s mean-reversion move lower also allowed the stock to retest its 50-day simple moving average (yellow line) as well as a nearer-term support line around the $198 mark, i.e. the blue horizontal. After a couple of days of testing this confluence support area, PANW stock on Wednesday gapped higher at the beginning of the day and continued to ascend for the rest of the day. This up-gap and rally move off well-defined support is crucial for the bullish setup that has now come to fruition. In fact, such a breakaway gap moves often offer high probability trading setups for both income as well as capital gains generation. Today I am holding a special webinar for InvestorPlace readers to teach this exact strategy. Register here. The trade setup thus now is very straightforward: Active investors and traders could look to buy PANW stock around the $207-$208 area with a well-defined stop loss at $198 and a next upside profit target at $220. Article printed from InvestorPlace Media, https://investorplace.com/2018/06/trade-of-the-day-palo-alto-networks-inc-sets-up-for-a-next-leg-higher/.